After beating Holy Name for the Division 1 state basketball title, the Central Catholic girls show off the spoils at the DCU Center. The senior forward averaged 18 points and 13 rebounds per game and led the Ducks to a 19-3 season. Gemma finished her career with 1,238 points and 1,040 rebounds. She also played varsity volleyball. Gemma will play basketball at Bentley next year. The Hockomock league MVP finished her career as a four-time league champion and a 2010 Division 2 state champion. She is a member of the 1,000-point club, and will play at Sacred Heart University on a full scholarship. Healy finished her career as Reading’s all-time leading scorer with 1,897 points and was a three-time Middlesex League MVP. She led the Rockets to two undefeated regular seasons and a 2012 Division 2 state title. She will play at the University of Richmond. Martin averaged 20 points and eight rebounds a game. The senior finished her career as a three-time Patriot League champion and a four-time league All-Star. She has committed to play basketball at Stonehill College. In her senior year, Veiga-Lee led Fenway to its second consecutive Division 4 title. The point guard averaged 24 points, 12.9 rebounds. and 8.5 assists in her final season. She finished her career with 2,082 total points. Only a freshman, Anderson burst onto the scene as the leading scorer and rebounder this year, averaging 19 points and 10 boards a game while earning Girls Independent League MVP honors. She is also a member of the volleyball and track teams. Bentd averaged 27 points, 8 rebounds, and 6 assists this season. She has started for Barnstable since eighth grade and holds the records as all-time leader in scoring and assists. She is the only Barnstable basketball player to score 1,000 career points as a sophomore. Burton reached her 1,000th-career point in February and averaged 18 points a game. She was selected as a Dual County League All-Star for the fourth consecutive season. She will play for Lehigh University on a full scholarship. After a season in which she averaged 22 points and 15 rebounds a game, Fogarty graduates with a school record 1,700 points and 1,100 rebounds. She earned ISL MVP honors and was a four time all-New England selection. An honor student, she will attend Marist. Gates earned a host of honors while leading her team to the NEPSAC Class E title. She was MVP of the tournament, as well as IGC MVP for the year while averaging 16 points. A NEPSAC All-Star, she finishes with 1,383 career points. The Dual County League (Large) MVP and two-time DCL ALL-Star averaged 17 points and 10 rebounds. As captain, Hyslip led Westford to the Division 2 North final where it lost to Central Catholic. She was also a DCL All-Star in soccer. Lumb averaged 13 points a game and led the Scarlet Knights to their first Greater Lawrence Holiday Festival Championship in over 20 years. She led her team in scoring for three straight seasons, ending her career with 1,081 points. She has committed to Hartford. 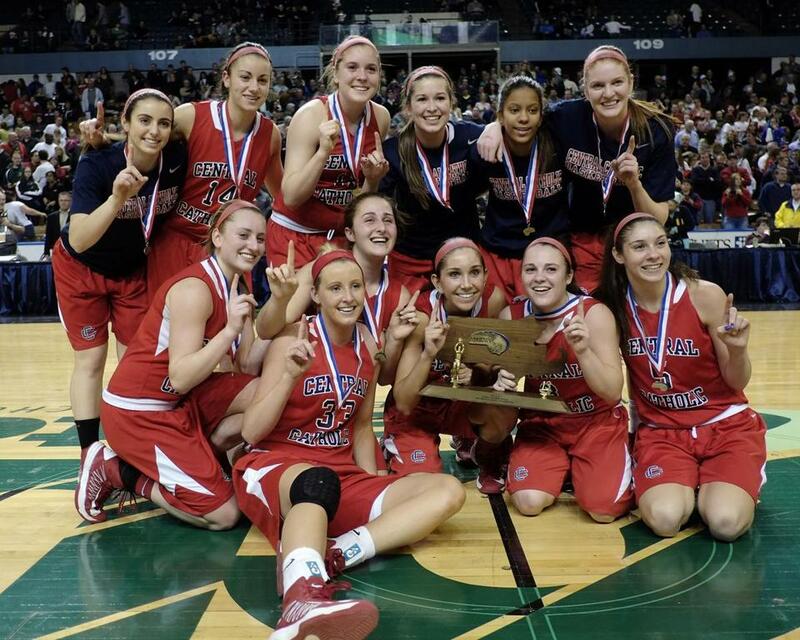 As captain, the senior forward led Central Catholic to a Division 1 state title. McLaughlin averaged a double-double with 17.4 points and 11.1 rebounds per game. McLaughlin will play at Stonehill College next year. Nguyen was named the EIL Player of the Year this season while leading LCA to a NEPSAC Class D runner-up. She filled up the stat sheet with 12 points, 4 steals, 4 assists, and 5 rebounds a game. Nguyen is a three-time NEPSAC All-Star. The 6-2 forward was named a Patriot League All-Star for the fourth time. North averaged 18 points and 13 rebounds per game. She reached the 1,000-point mark in her junior year and finished her career with 1,534 points. She will play for Tufts. The junior point guard averaged 13.1 points and five steals to lead Medfield to its first Division 2 state title. Petit was named co-MVP of the Tri Valley League and selected to the All-League First Team. She is a two-time Division 2 champion in soccer. 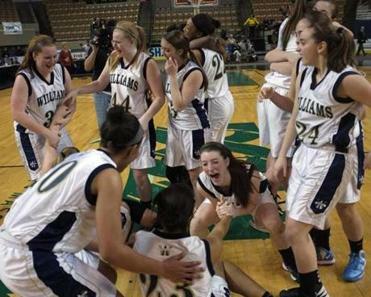 Archbishop Williams players celebrated their win over Lee during the Division 3 finals. The senior guard was named MVP of the Catholic Central League after averaging 10.5 points per game. She reached the 1,000th-point mark this season and led her team to the Division 3 state title. She will play at Southern New Hampshire University next year. Serrette scored her 1,000th career point this season and averaged a double-double with 18 points, 11 rebounds and 5 blocks a game. She was named Dual County League MVP and was selected as a league All-Star for the third time. This season, Thomas-Waheed averaged a double-double with 18 points and 10 rebounds a game. in her junior season, Thomas-Waheed scored 700 points and posted 12 double-doubles. She was also selected as a Bay State League All-Star. This season, Doneski led the Indians to an undefeated league record and an overall 20-3 record with a Merrimack Valley Championship. The Billerica and Holy Cross graduate completed his third season with a 49-16 record in his short coaching career. The three-time Tri Valley League coach of the year led a well-balanced Medfield team to its first ever Division 2 South and state championship. In his 12 years of coaching, the five-time TVL champion has a career 208-59 record. In his 10th season of coaching Archbishop Williams, Bancroft led a young Archies team to a Division 3 state title. The West Boylston graduate has a 170-86 career record in his 30 year coaching tenure. The Wentworth Institute of Technology graduate completed his 10th season as a Mayflower Conference and State Vocational champion with a 23-1 record. The two-time conference coach of the year has an overall 59-13 coaching record. Atlantic Coast — Falmouth: Grace Geary, Alexa Johnson. Marshfield: Maggie Ahearn, Katlyn Jesse, Lea Viola. Nauset: Jenny Leyton. Plymouth North: Samantha Burkhead, Meghan Walsh. Plymouth South: Becca Laudermilk. Sandwich: Erin Gendreau. Bay State — Braintree: Bridget Herlihy, Molly Reagan, Ashley Russell. Dedham: Emily Hill. Framingham: Leah Douty. Natick: Katie Anderson, Bridget Furdon. Needham: Maddie Ganser. Newton North: Madison Beatrice, Maddie Bledsoe, Infiniti Thomas-Waheed. Norwood: Makenna Lane. Walpole: Summer King, Bridget Nicholson. Wellesley: Charlotte Bussema, Sophia Mavrommatis. Big Three — Brockton: Chantel Jordan, Chanelle Melton. Durfee: Bailey Brooks, Brianna Camara, Toni Migliore. New Bedford: Katherine Guillotte. Boston City — Boston English: Ashley Louis-Jean, Trayana Mair. Brighton: Amy Bernardez. Burke: Vanessa Anderson, Brenda Calderon, Kirina Laryea. Charlestown: Andrienne Allison, Sara Centeio, Shannon Simpson. Dorchester: Gladys Amber, Kymesha Kelley. East Boston: Chuckera Johnson, Emily Padilla, Renata Pinto. Fenway: Cadeija Matthews, Takora McIntyre, Tajanay Veiga-Lee. Latin Academy: Fiona Sugrue, Ayjah Willis. Madison Park: Amber Edwards, Krystal Edwards. New Mission: Deandra Humphries, Jazsala Laracuente, Shantal Solomon. O’Bryant: Kiana Daley, Yonetta Harris, Raven Kelsey. Snowden: Stephanie Morales. South Boston: Destinee Morris, Daitannah Smith, Elaina Wright-McCarthy. West Roxbury: Karleah Malcolm, Ronasia Perry. Cape Ann — Georgetown: Marisa Agganis, Kristin Hogan, Ali Newbury. Hamilton-Wenham: Cassandra Fibbe. Ipswich: Julia Davis, Brigid O’Flynn, Masey Zegarowski. Masconomet: Nicole Femino, Hannah Kiernan, Claudia Marsh. Newburyport: Mary Pettigrew. North Reading: Morgan Maiola. Pentucket: Kelsi McNamara, Alexandra Moore, Tess Nogueira, Nicole Viselli. Catholic Central — Archbishop Williams: Olivia Conrad, Sara Ryan, Leah Spencer, Jaylen Williams. Arlington Catholic: Maura Buckley, Presley Silva. Austin Prep: Nicole Hemme. Cardinal Spellman: Emma Dagesse. Cathedral: Jade Moore. Cristo Rey: Deja Miller. Lowell Catholic: Sarah Callahan, Madison Medina, Estelle Penta. Marian: Elizabeth Horan, Devan Robidou. Matignon: Sara Villanova. Pope John: Gianni Hill, Linda Perry, Amanda Reis. St. Clement: Katie Monestime, Jessica Popken. St. Joseph’s Prep: Lexie Corey, Aria Ross. St. Mary’s: Jennie Mucciarone, Brianna Rudolph, Sharell Sanders. Catholic Conference — Ursuline: Kristin Hickey, Katie Hicks. Dual County — Acton-Boxborough: Becca Shamah, Sarah Smith. Bedford: Kristen Bullock, Amanda Cohen, Samantha Cowan, Alaina Greaney. Boston Latin: Dierbhile Martin, Maggie Mulligan. Concord-Carlisle: Halle Burns, Angela DeBruzzi. Lincoln-Sudbury: Ashley Lutz, Kristen Ngan. Newton South: Kayla Burton, Jessa Rubera. Waltham: Olivia Gardiner, Leah Wheaton. Wayland: Daly Place. Westford: Hannah Hackley, Samantha Hyslip, Meghan Kibblehouse. Weston: Hannah Graves, Saliah Serrette. Eastern Athletic — Bishop Feehan: Cara Adams, Lauren Donahue, Sierra Schrader. Bishop Stang: Morgan Lester. Coyle & Cassidy: Lindsay Bumila. Martha’s Vineyard: Jennie Lindland, Maggie Riseborough, Katie Steward. Somerset Berkley: Gassey LePage. EIL — Bancroft: Reese Gibson. Beaver Country Day: Ciara Dillon, Kayla Duarte. Berwick: Dominique St. Pierre, Torieana St. Pierre. Dana Hall: Emily Dumont. Lexington Christian: Victoria Nguyen, Caroline Niland, Kallan Roys. Pingree: Katlyn Oliver. Portsmouth Abbey: Ann Gallagher. Greater Boston — Cambridge: Donnaizha Fountain, Sarrana Jeanty. Everett: Talia Riccioli. Malden: Bridget Furlong. Medford: Sarah Donnelly, Aleigha McAusland-Ace. Somerville: Melissa Baptista, Indira Evora, Ester Josephs. Hockomock — Attleboro: Beth Clifton. Foxborough: Ashley Snyder, Katherine Tamulionis. Franklin: Alicia Kutil, Lexi Martin. King Philip: Grace Davis. North Attleborough: Melissa Beaupre, Meghan Ronaghan, Gina Stoyle. Oliver Ames: Caitlyn Abela, Asia Mitchell. Sharon: Katie Lowerre, Karlie O’Driscoll. Stoughton: Nicole Daniels, Mackenzie McGrath. Taunton: Angie Martinez. IGC — Brimmer & May: Heather Gates, Jordan Rockland. Cambridge Weston: Chloe Knopp. Chapel Hill: Lexi Knowlton-Simard. Gann Academy: Rebecca Jackson, Sarah Litwin, Maddie Rodman. Landmark: Brooke Williams. Montrose: Katherine Casey. Waring: Eleanor Lustig. Woodward: Ava Small, Cassie Wesner. ISL — Brooks: Thalia Garcia. BB&N: Courtney Ericson, Lydia Zaleski. Governor’s Academy: Kat Fogarty. Lawrence Academy: Emily Pratt. Milton Academy: Anna Lachenauer, Chandler Quintin, Jordan Quintin. Nobles: Katie Benzan, Lauren Dillon, Kate Kerrigan, Alex Maund. Rivers: Jen Berkowitz, Emilee Daly, Kristen Daly, Vanessa Edgehill. St. George’s: Jessica Hom, Theresa Salud. St. Mark’s: Mathilde Sauquet. Thayer: Lexi Windwer. Mayflower — Avon: Maggie Hoffman. Bishop Connolly: Jessica Fournier. Blue Hills: Michaela Adams, Margarita Delaporta, Tayler Wornum. Bristol Aggie: Hannah Rogers. Bristol-Plymouth: Courtney Mosher. Diman: Lexie Botelho. Holbrook: Jaliyah Jones-Robinson. Norfolk Aggie: Aliana Braken, Melissa DeNapoli. Old Colony: Amanda Frey, Alex Gordon. Sacred Heart: Erin Bracken. South Shore Voc-Tech: Giavanna Campitelli. Southeastern: Val Martinez. Tri-County: Kate Cornell. Upper Cape: Allison Krystofolski. West Bridgewater: Tiarra Murrell, Christine Schondek, Brittany Stone. Westport: Sam Medeiros, Layla Morgan. Merrimack Valley — Andover: Jackie Alois, Devon Caveney, Angelice Gonzalez, Michaela Mello. Billerica: Shannon Hayes, Brittany Lomano. Central Catholic: Casey McLaughlin, Courtney Walsh. Lowell: Alexi. Schecter. Methuen: Amanda Petrow. North Andover: Morgan Lumb. Middlesex — Belmont: Olivia Lyons. Burlington: Sarah Hood. Lexington: Kristyn Kajko, Anna Kelly, Kate Powers. Melrose: Kayla Wyland. Reading: Sarah Haase, Olivia Healy. Stoneham: Samantha Trant. Wakefield: Kristie McNall. Watertown: Rachael Campbell, Gabrielle Coppola. Wilmington: Christa Brent, Michelle Woods. Woburn: Samantha D’Angelo. Northeastern — Beverly: Andrea Zelano. Danvers: Emily McNulty, Kasey Sherry. Gloucester: Sophie Black, Juliana Costanzo. Lynn Classical: Monta Connolly, Kristin Lauria, Deidra Newson, Catherine Stinson, Diondra Woumn. Marblehead: McKenna Barrett, Emily Freedland. Peabody: Alexandra Lomasney, Carolyn Scacchi. Revere: Caitlyn Caramello, Gena Restiano. Salem: Jaclyn Panneton, Rachel Zipper. Saugus: Norma Waggett. Swampscott: Alexa Goldman, Ara Talkov. Winthrop: Ashelyn Babb, Temisan Meggison, Kristen Siscarnanis. Old Colony — Barnstable: Molly Bent, Colleen Kenney, Stefanie Martin, CeYanna Soares. Bridgewater-Raynham: Madison Barron, Valerie Hoyle. Dartmouth: Morgan Gidley, Lauren Pires, Ally Pontes, Nicky Simas. Patriot — Duxbury: Maddie Foote, Michela North, Kate Norton, Bridget Quilty. Hanover: Stephanie Flynn, Marie Ribadeneyra, Becca Ritchie. Hingham: Sydney Blasetti, Haleigh Welch. North Quincy: Caitlin Bulger, Jane Minton, Maya Umoren. Pembroke: Lauren Hickie. Quincy: Nicole Jorgensen, Kayla McArdle. Scituate: Kelly Martin, Annie Miller. Silver Lake: Bridget Hughes, Brie Walker. Whitman-Hanson: Erin Clifford, Marina Kelly. South Coast — Bourne: Shelby Corsano, Chelsea Doucette, Brie Girouard. Fairhaven: Ashley Brown. Greater New Bedford: Nakira Examond. Old Rochester: Abby Offringa, Gabby Reuter. Wareham: Amber Filkins, Breanna Muir. South Shore — Abington: Stephanie Cornish, Amanda Hawksworth, Nora O’Neil. East Bridgewater: Samantha Cardinal, Olivia Signori. Hull: Kelsey Diemer, Betsy Pearlman. Monomoy: Tia Gurley, Meghan Richer. Norwell: Brenna Diggins, Caroline Walsh. Rockland: Allie Cerrato, Kyra Rose. Tri-Valley — Ashland: Ilyza Holman, Natalie Leone. Bellingham: Meg Edwards. Holliston: Lindy Kyger, Kylie Lorenzen. Hopkinton: Tess Chandler, Meghan Hynes. Medfield: Kristin Fechtelkotter, Jen Narlee, Payton Ouimette, Lauren Petit. Medway: Sarah Hope. Millis: Amy Assad.